It's been a long time since I wrote a letter. Just like everyone else, I've gotten caught up in email correspondence (and worse -- text messages), and writing actual notes with my hands on paper has become lost over time. I was also an early adopter of email relative to my generation, so I've actually been failing to write letters for many years now! The shame. The good news is that there is one area where I still excel -- and that's in writing little notes to Scott that I leave around the house, as well as birthday and holiday cards to my family & friends. I always make sure that the cards I send out are cards I've spent real time on, and I write heartfelt things inside them. I find that this really makes a difference. If you write down your feelings, they will be appreciated .... especially if they are in your own penmanship, not typed on a computer. Do you agree with this assessment of things? Handwritten words somehow mean more, and seem more personal. Notebooks & a notepad I use to hand write "stuff"
Normally I would show you a picture of our holiday card, but it hasn't been sent out yet (we're due to receive them in the mail next week)! Instead, above I have included a snapshot of some of the paper I use to write with these days: on the left is an adorable lined notebook I got before Borders closed in 2009; I've yet to write in it (there's something about a new notebook, isn't there?). That's because in the middle is my battle scarred black Moleskine, which has graph paper and years worth of diary entries, coloring & lists (and deep dark secrets!) in it. 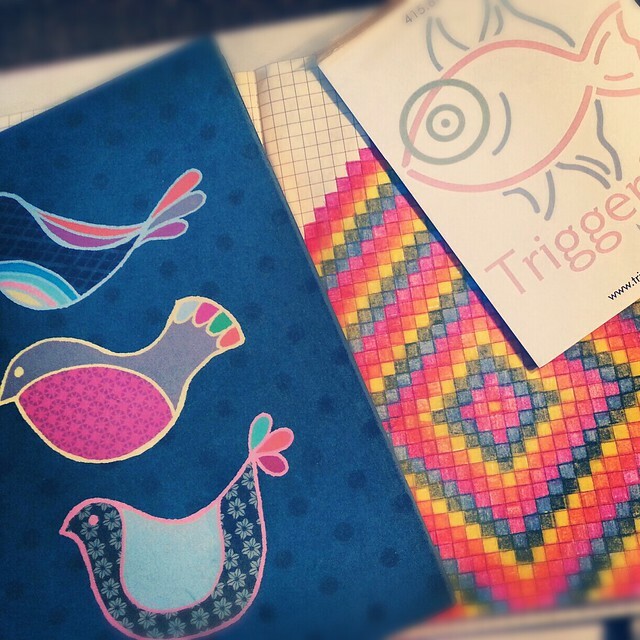 On the right is a Triggerfish Marketing notepad, which is what I use to write little notes to Scott on (along with, you know, takeout orders). I need to get some cute stationary and start writing letters again. I mean, I always say that, and then it never happens, but I feel particularly motivated right now because of recent events. I've been surprised and overwhelmed with happiness by the number of physical, handwritten condolences cards we've received from friends since Jeffy died. This was something I honestly didn't expect, and when the cards began rolling in (they surpass Christmas cards at this point), I was overwhelmed. The cards are heartfelt and mean so much to Scott and I. It's made me realize the value of such things. So ... here's to handwritten letters? Who wants to be my pen pal?